To seek knowledge is a sacred duty, it is obligatory on every Muslim, male and female. The first word revealed of the Quran was "Iqra" READ! Seek knowledge! Educate yourselves! Be educated. Surah Al-Zumr, ayah 9 reveals: "Are those equal, those who know and those who do not know?" Surah Al-Baqarah, ayah 269 reveals: "Allah grants wisdom to whom He pleases and to whom wisdom is granted indeed he receives an overflowing benefit." Centuries old monarchy, colonialism and the oppressive rule of their own people have brought about moral and spiritual degeneration of Muslims throughout the world. To retrieve them from this degeneration, it?s about time that the Muslim Ummah restructures its educational priorities along Islamic lines, fulfilling the existing needs as well. By virtue of such an educational program, the future generations will become the torch-bearers of Islamic values and play an effective role in the present world. The challenges of modern times call for rebuilding the structure of our educational program on such a foundation as to fulfil our spiritual as well as temporary obligations. 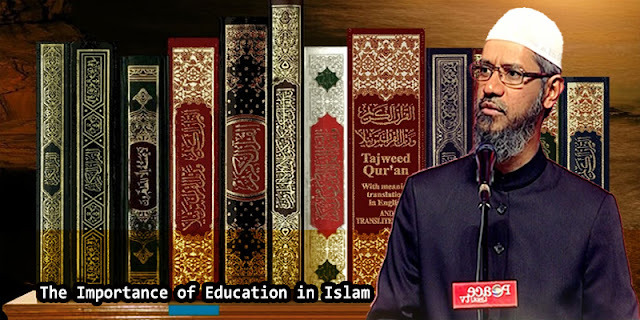 Today we need an education system which can produce, what the late Sayyid Abul A?la Mawdudi said, "Muslim philosopher, Muslim scientist, Muslim economist, Muslim jurist, Muslim statesman, in brief, Muslim experts in all fields of knowledge who would reconstruct the social order in accordance with the tenets of Islam." The Muslims today are the most humiliated community in the world. And should they persist in following the same educational program as given by their colonial masters, they will not be able to recover themselves from moral and spiritual decadence. Ibn Masud (Allah be pleased with him) reported that the Messenger of Allah (S) said: The position of only two persons is enviable; the person whom Allah bestowed wealth empowering him to spend it in the way of righteousness, and the person whom Allah gave wisdom with which he adjudges and which he teaches to others. Now how can we become Muslims in the true sense of the word? First lets define what a Muslim is. A Muslim is not a Muslim simply because hes born one. A Muslim is a Muslim because he is a follower of Islam, a submitter to the Will of Allah. Were Muslim if we consciously and deliberately accept what has been taught by the Prophet Muhammad (S) and act accordingly. Otherwise we?re not true Muslims. The first and most crucial obligation on us is to acquire knowledge and secondly to practice and preach this knowledge. No man becomes truly a Muslim without knowing the meaning of Islam, because he becomes a Muslim not through birth but through knowledge. Unless we come to know the basic and necessary teachings of the Prophet Muhammad (S) how can we believe in him, have faith in him, act according to what he taught? It is impossible for us to be a Muslim, and at the same time live in a state of ignorance. It is essential to understand that the greatest gift of Allah ? for which we are so over whelmed with gratitude ? depends primarily on knowledge. Without knowledge one can?t truly receive Allah?s gift of Islam. If our knowledge is little, then we will constantly run the risk of losing that magnificent gift, which we have received unless we remain vigilant in our fight against ignorance. A person without knowledge is like someone walking along a track in complete darkness. Most likely his steps will wander aside and he easily can be deceived by shaytaan. This shows that our greatest danger lies in our ignorance of Islamic teachings and in our unawareness of what the Qur?an teaches and what guidance has been given by the Prophet (S). But if we are blessed with the light of knowledge we will be able to see plainly the clear path of Islam at every step of our lives. We shall also be able to identify and avoid the dangerous paths of Kufr, Shirk and immorality, which may cross it. And, whenever a false guide meets us on the way, a few words with him will quickly establish that he is not a guide who should be followed. On this knowledge depends whether our children and we are true Muslims and remain true Muslims. It is therefore not a trivial to be neglected. We do not neglect doing whatever is essential to improve our trades and professions. Because we know that if we do neglect, we will starve to death and so lose the precious gift of life. Why then should we be negligent in acquiring that knowledge on which depends whether we become Muslims and remain Muslims? Does such negligence not entail the danger of losing an even more precious gift ? our Iman? Is not Iman more precious than life itself? Most of our time and labor is spent on things, which sustain our physical existence in this life. Why can we not spend even a tenth part of our time and energy on things, which are necessary to protect our Iman, which only can sustain us in the present life and in the life to come? It is not necessary to study extensively to become a Muslim. We should at least spend about one hour out of twenty-four hours of the day and night in acquiring the knowledge of this Deen, the way of life, the Islam. Every one of us, young or old, man or woman, should at least acquire sufficient knowledge to enable ourselves to understand the essence of the teachings of the Quran and the purpose for which it has been sent down. We should also be able to understand clearly the mission, which our beloved Prophet (S) came into this world to fulfil. We should also recognize the corrupt order and system, which he came to destroy. We should acquaint ourselves, too, with the way of life which Allah has ordained for us. Knowledge is identified in Islam as worship. The acquiring of knowledge is worship, reading the Quran and pondering upon it is worship, travelling to gain knowledge is worship. The practice of knowledge is connected with ethics and morality ? with promoting virtue and combating vice, enjoining right and forbidding wrong. This is called in the Qur?an: amr bil-l maruuf wa nah-y ani-l munkar. Not only should we seek knowledge, but when we learn it, it becomes obligatory on us to practice it. Though we must remember that correct knowledge should come before correct action. Knowledge without action is useless because a learned person without action will be the worst of creatures on the Day of Resurrection. Also, action should not be based on blind imitation for this is not the quality of a thinking, sensible human being. Knowledge is pursued and practiced with modesty and humility and leads to beauty and dignity, freedom and justice. The main purpose of acquiring knowledge is to bring us closer to God. It is not simply for the gratification of the mind or the senses. It is not knowledge for the sake of knowledge or science for the value of sake. Knowledge accordingly must be linked with values and goals. One of the purposes of acquiring knowledge is to gain the good of this world, not to destroy it through wastage, arrogance and in the reckless pursuit of higher standards of material comfort. Another purpose of knowledge is to spread freedom and dignity, truth and justice. It is not to gain power and dominance for its own sake. Obviously, what we may call the reservoir of knowledge is deep and profound. It is a vast and open field that is not limited. It is impossible for anyone to gain anything more than a fraction of what there is to know in the short span of one?s life. We must therefore decide what is most important for us to know and how to go about acquiring this knowledge. The following ahadith shows how important and how rewarding knowledge is. We, the children, are the future. The future lies in our hands, but only through knowledge because whoever neglects learning in youth, loses the past and is dead for the future.